We are happy to announce The first ClusterDX weekend meeting 2017 In the Netherlands in the city of Bolsward. Where the ClusterDX is found. This event will be open for all ClusterDX members. Setting Digital Master to broadcast digitally using a portable radio. Now the spots from ClusterDX You can follow on Twitter. By sending a new spot goes automatically to Twitter.The person using Twitter, it is up to date, which can be heard on the frequency of 11 meters. 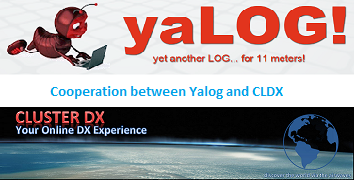 Enjoy yaLOG with the ClusterDX!